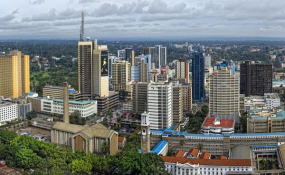 An overview of the Central Business of Nairobi City. According to the World Bank's latest Africa Pulse report the global oil market outlook remains highly uncertain and dependent on whether the production cuts among the Organisation of Petroleum Exporting Countries and its partners will be extended while regulatory uncertainties are adversely affecting the oil sector in Angola and Nigeria. "Macroeconomic policy frameworks remain a concern, as some countries have not yet reconstituted an adequate fiscal space, have a costlier and riskier debt profile, and still register large current account deficits and double-digit inflation rates," says the report dated April 2019. This slowdown was more pronounced in the first half and reflected weaker exports from the region's large oil exporters such as Nigeria and Angola, due to falling oil production amid higher but volatile international crude oil prices. "A deeper contraction in Sudanese economic activity, and a slowdown among non-resource-intensive countries, also played a role," the report says.